1. 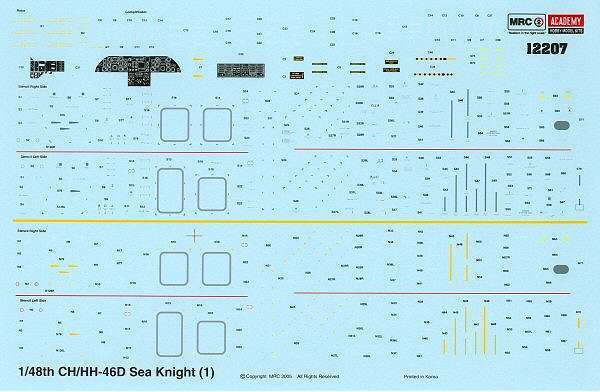 Academy/MRC have now released the third version of their 1:48 Sea Knight, this time it's #12207, the "US Navy Version" CH/HH-46D. 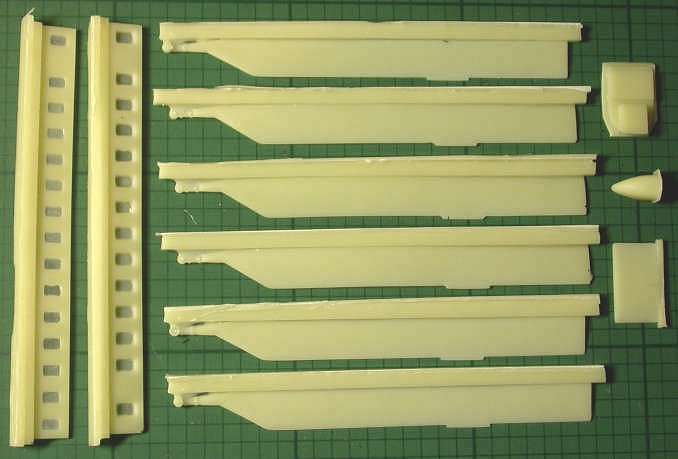 Test shots of the sprues for new 1:144 Revell Apache are at DPMV, (click on Aktuell or I-Punkt in the menu). We now have confirmation that the recently released Revell Ka-52 Alligator #04483 is made from the same moulds as Zvezda's second (and very good) version of their Ka-52 #7224 (see HKN #136). The decals are much better though. 3. 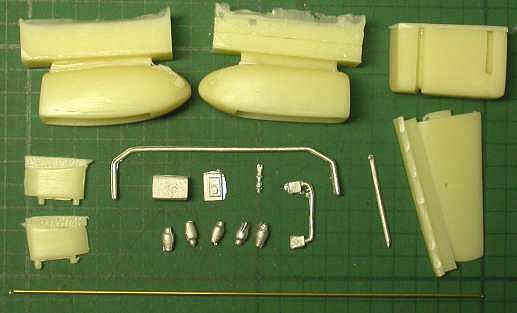 Belcher Bits are working on updates for their 1:48 Lynx kits, both army and navy versions. These will include the (naval) Super Lynx, with new decals for Malaysia, South Korea and others. 4. New from Cobra Company is #35017, a resin XM-23 Doorgun set (M-60D) for the Panda UH-1 kits. This comes complete with rubber ammo belts. 5. Heritage Aviation have released a new Whirlwind HAR.10 nose job, labelled "Mk.10 Tropical Nose" (#72009). Unfortunately HKN carelessly managed to miss seeing this at the recent Scale ModelWorld 2005, so there are no further details at the moment. 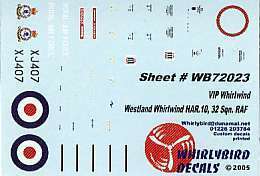 WBA72040 is their resin, brass and white metal set, plus decals, to convert the Italeri/Revell MH-47 kits into a Model 234 Civil Chinook. The resin parts are a set of new composite rotor blades, airliner window inserts, an air-stair door, overhead console, and an air-con intake scoop. 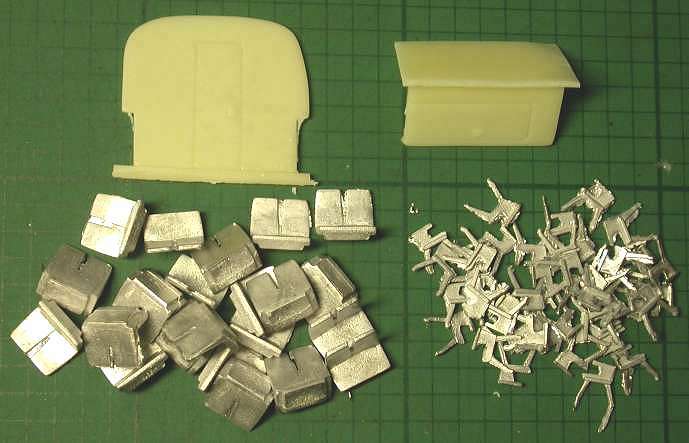 In white metal you get copies of the four kit undercarriage struts (for extra strength), a couple of blade aerials, and the front part of the air-con scoop. 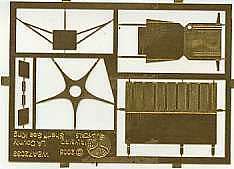 On the brass fret there are eight cockpit panel facias, a pair of glide-slope loop antennae, a pair of windscreen wipers, and hinges for the air-stair door. The airliner window inserts feature tapered openings (wider on the inside). 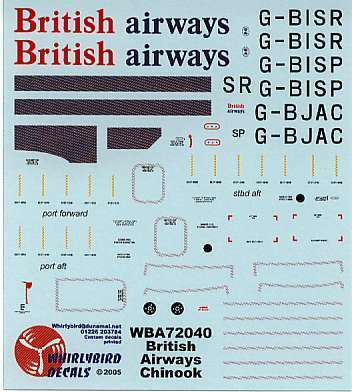 On the decal sheet there are markings for three British Airways machines, which include good number of stencils, plus walkways and doorway / hatch outlines (see decal placement artwork in HKN #212). 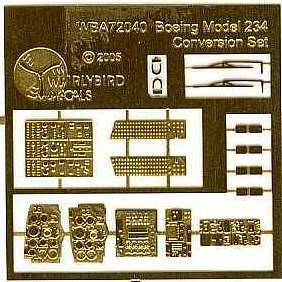 To complement the conversion set, WBA72042 is an interior detail set for the Model 234 Chinook. The main components are 22 white metal seats and their seat frames (left and right). Also provided in etched brass are a row of overhead lockers for each side of the cabin, steps for the inside of the air-stair door, a detailed face for the front bulkhead, and a tiny 'EXIT' sign for the front bulkhead. 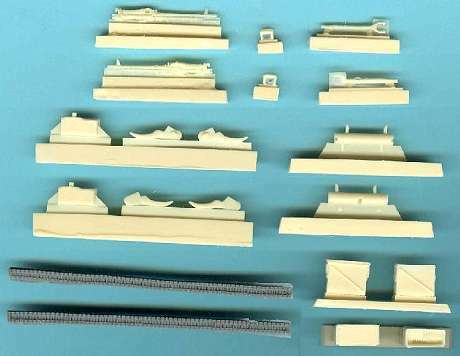 In resin there is a rear bulkhead and a toilet compartment, and two pieces of plasticard are provided to make a cabin ceiling and sides for the air-stair steps. 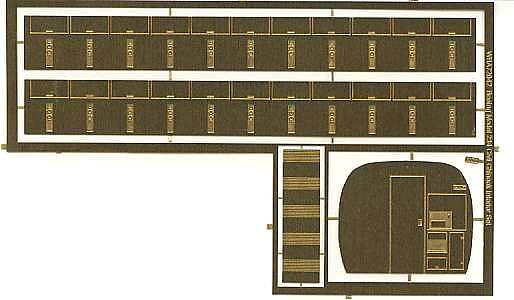 The instructions provide four different seating / cargo space combinations; plus a detailed procedure for drilling the floor to take the chosen seating arrangement, including a template. WBA72039 is a resin, brass and white metal set, plus decals, to convert the Revell HAS.6/AEW Sea King into an ex-SH-3H as used by the Los Angeles Sheriff's Department. 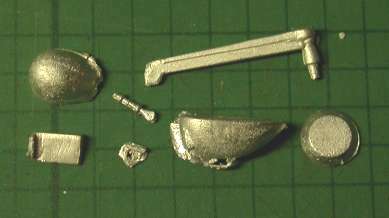 The resin parts are a pair of sponsons and their attachment 'wings', a long-span tail-plane, and a jig that is used to for bending a length of brass rod (provided) into the handrail that surrounds the platform on the starboard sponson. In white metal you get 5 rotor-head balance weights, cabin door handrail and footrail/grab handle, a winch head and hook, the tail-plane support strut, and a re-fuelling point. The brass parts are the balance-weight 'spider', the starboard sponson platform, cabin door platform, winch support framework, and a pair of blade aerials. 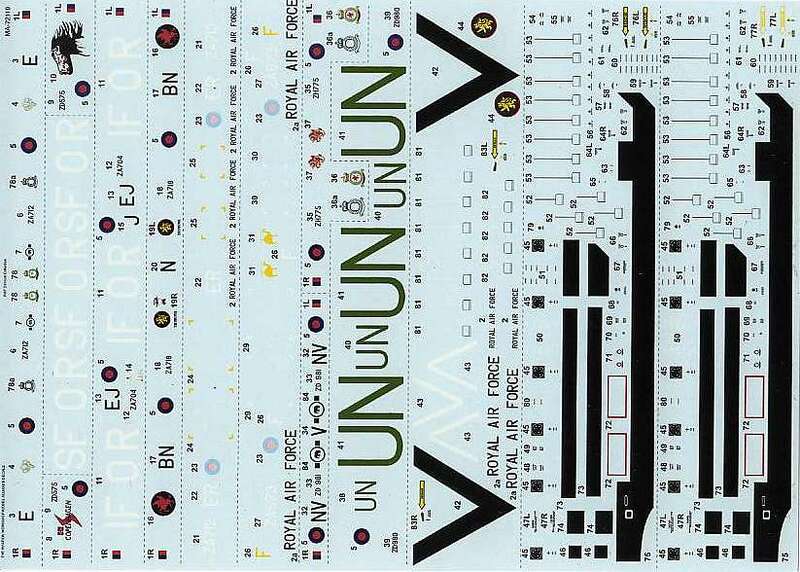 The decals are on two sheets, one with the gold markings, the other with the remaining components of the roundels in normal colours. The rather complex paint scheme, including narrow white cheat lines, is left to the skill and ingenuity of the modeller, though some suggestions for matching Humbrol paints are given. The instructions include a number of invaluable photographs, plus a diagram showing how to modify the kit rotor blades to the correct profile. WBA72038 is a small white metal set for the USAF UH-1H, comprising a four-part roof-mounted winch, two radomes, and a glide-slope antenna. 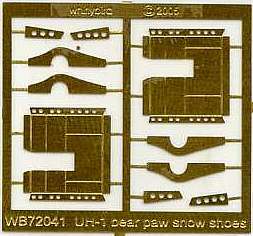 WBA72041 is an etched-brass fret to make a pair of 'Bear Paw' snowshoes, as used on UH-1D/H, AB212, AB412, particularly by European air arms operating in mountainous terrain. This is also available in 1:48, WBA48003. WBA72044 is an etched brass fret to make a set of Whirlwind HCC.8/12 steps, plus the pitot tube. 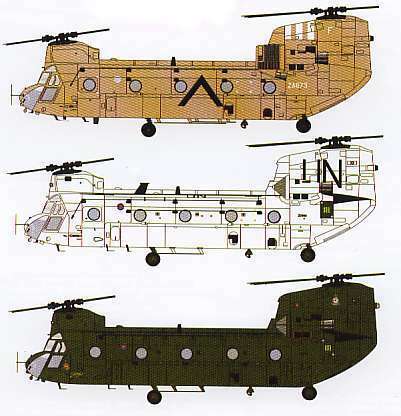 Future products planned by Whirlybird that haven't already been mentioned in HKN include a LA Sheriff's Sea King in 1:48, a corrected tail for the 1:72 Italeri UH-1C, and a winch set for the UH-1E, also 1:72. 7. 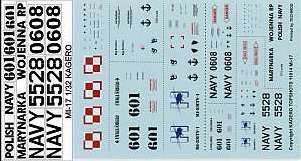 Whirlybird have also issued another decal sheet. WB72023 'VIP Whirlwind' makes HAR.10 XJ407 as flown by No.32 Metropolitan Communications Sqn. from RAF Northolt in the 1970's. MAS-729014, RNZN SH-2F/G Seasprites. 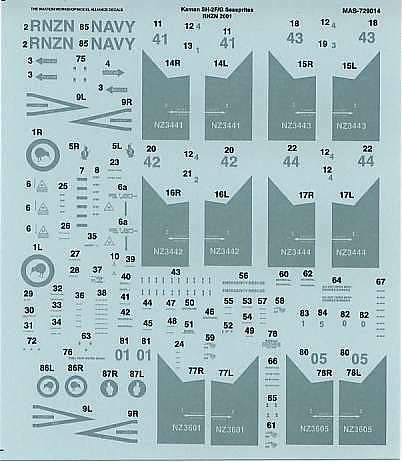 This gives you markings for any one of four SH-2F or two SH-2G. All are light grey with low-visibility grey markings and black walkways. MAS-729019, CH-126 Sea King 443 Sqn CAF 60th Anniversary 'Hornet' scheme (previewed in HKN #209). 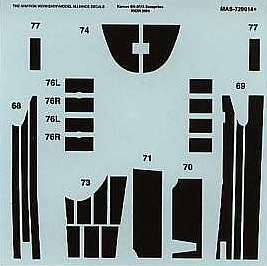 This is also available in 1:48, MAS-489019. MAS-729005, CH-146 CAF SAR, & 412 Sqn 60th Anniversary scheme. 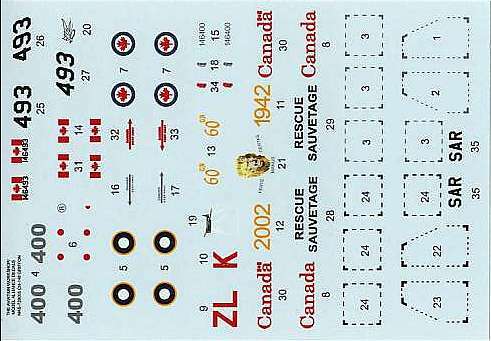 On this sheet there are markings to make two aircraft, one a yellow & red Rescue/Sauvetage Griffon 146493, the other the black-painted 2002 special 146400 with WW2 style ZL-K markings on one side and a lion's head on the other. All four decal sheets show absolutely top-quality printing, and come with detailed colour instructions. The Chinook comes with a multi-page book of instructions (though my example is let down by poor colour registration and serious dereliction of duty in the proof-reading department - but don't let this put you off!). A set of dust filters to go with the Op Granby aircraft is due to be released by the Aviation Workshop very soon, and we are promised that their 'Ark Royal' book, with Wessex and Whirlwind decals, has finally made it to the printers. Also in preparation is a set of decals entitled 'Tigers Roar', which will include the UK Army 2005 Tigermeet Lynx, the spectacular French tiger-marked Lynx, and a CAF tiger-marked Huey. 9. Coming soon from Twobobs Aviation Graphics will be #48-112/35-002 AH-1W Whiskey, HMLA-169 Show Scheme (two scales on the one sheet). 10. Latest in the Kagero 'Topshots' series is a book on the Mi-17 in Polish service. 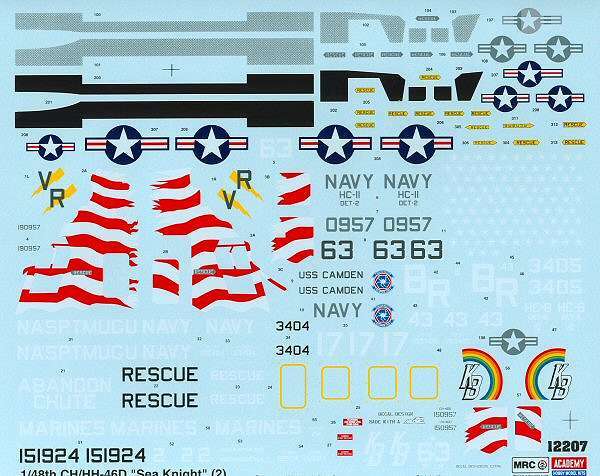 This includes decals in 1:72 and a masking foil for basic markings in 1:35. 160 photos on 44 pages, ISBN 838908886X. Thanks to Pawel Okulski, Bob Sanchez (Twobobs), Chris Miller (Cobra Co.), Roger Evans (Whirlybird), Mike Belcher (Belcher Bits), and Gary Madgwick (Aviation Workshop).